Dirt: it pretty much defines American motorcycle racing. Powered moto-cycles were first introduced to the USA on bicycle velodromes as pacers, but outside the arena, paved roads were very rare. Only the very center of larger towns had cobblestones, while the rest of the country faded from dirt roads to cart tracks to horse paths, the farther on traveled from a city. 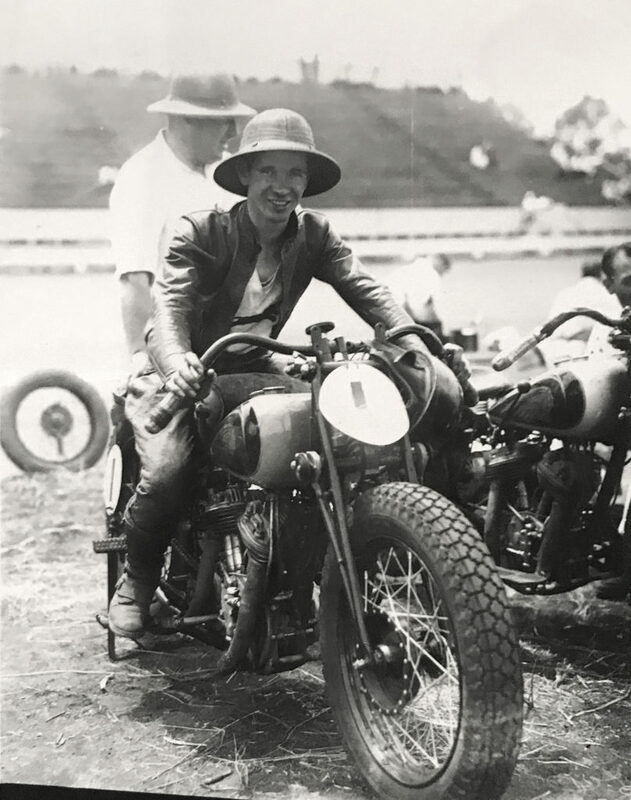 Adventurous cross-country riders before the 1920s encountered amazing hazards and an absolute lack of roads in many areas of the Midwest and far West. 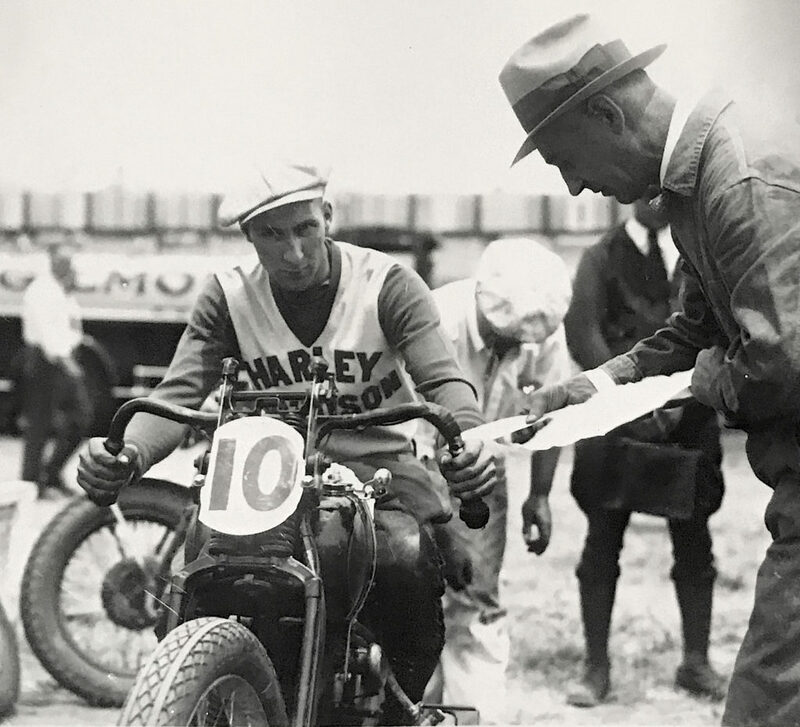 Former velodrome promoter Jack Prince expanded the concept of a banked competition track into board tracks meant for cars and motorcycles, and while these were popular in every major town, the number of potential competitors was tiny, because the number of capable, purpose-built track racers was also tiny. Where ‘real’ riders raced was away from the glamour of the boards, out on the dirt. 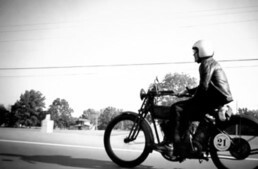 Dirt was everywhere before suburban expansion and paved roads – every farmer’s field and horse-racing track was a potential motorcycle course. Plowing and smoothing an oval or circular track was a pretty simple proposition, using agricultural machinery. Add a few bleachers and voila, you’ve got a real racetrack. 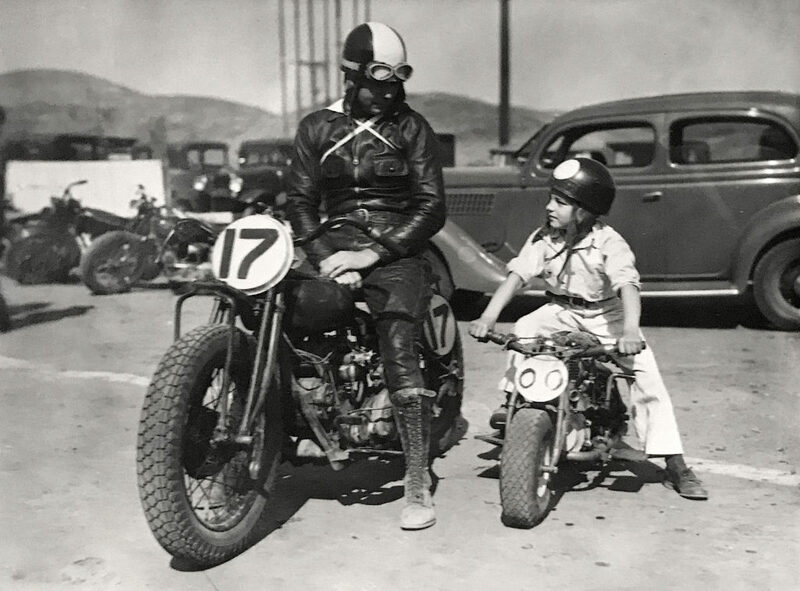 Dirt track racing evolved in the mid-1920s into a specialized sport, with light and very fast 500cc racers making spectacular viewing around the world. 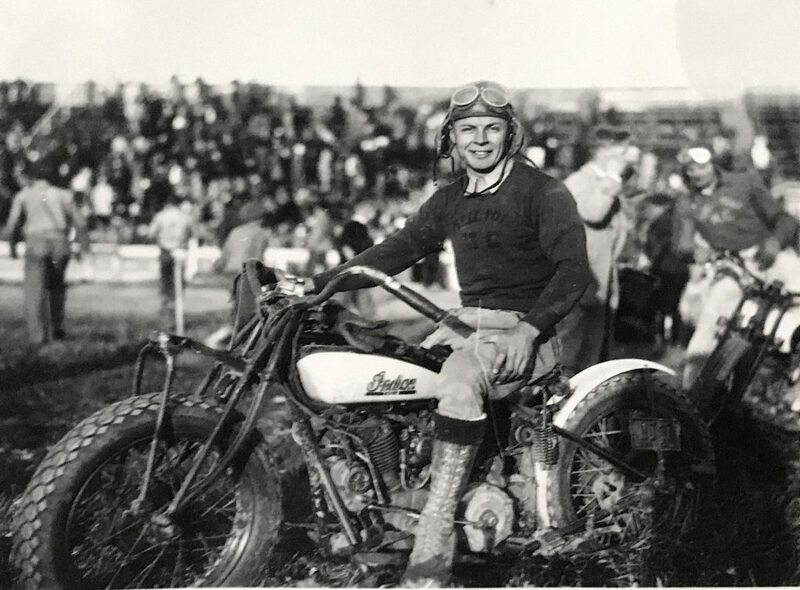 It was the great dirt track craze, and tens of thousands of people swarmed the early races, while big tracks were built in Australia, New Zealand, Argentina, and England, creating a year-round global racing circuit for professional riders like Sprouts Elder, Red Wolverton, and Fay Taylour. 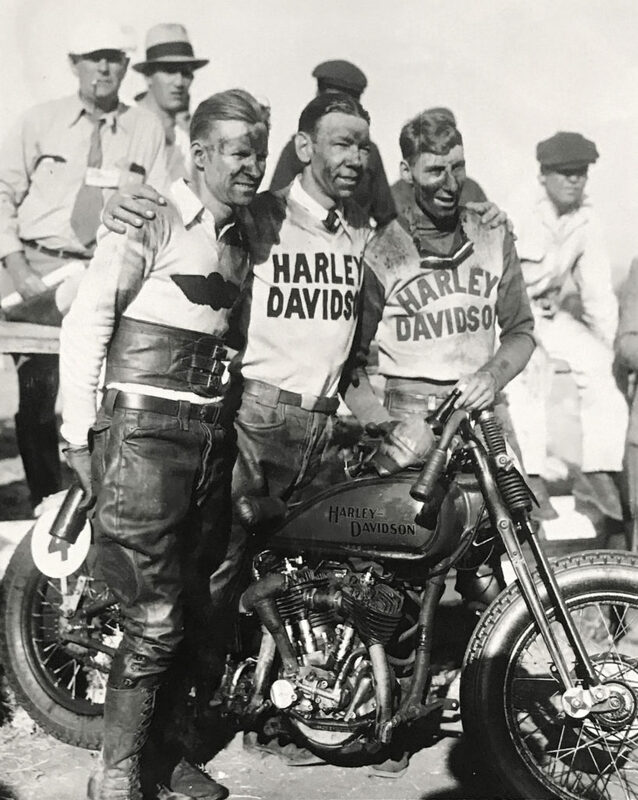 The Great Depression of 1929 took a big bite out of American racing, as the Big 3 of 1930 – Excelsior-Henderson, Indian, and Harley-Davidson – shrunk to the Big 2 when Ignaz Schwinn quit making Excelsior-Hendersons in 1930. 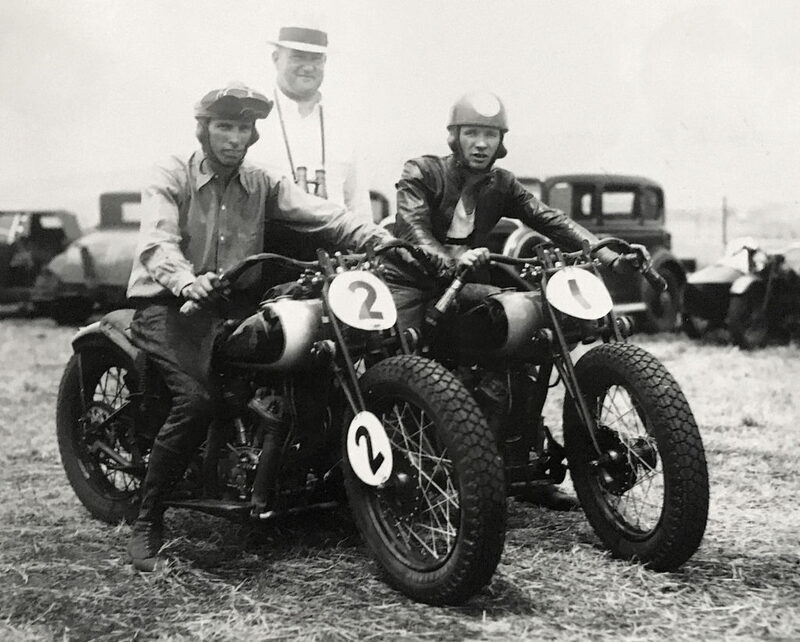 Neither Indian nor Harley-Davidson had the capital to develop exotic racing machines for Class A racing (the 8-Valves, the OHCs, the super-tuned flatheads), so they worked with the AMA to create a production-based racing class for the dirt. 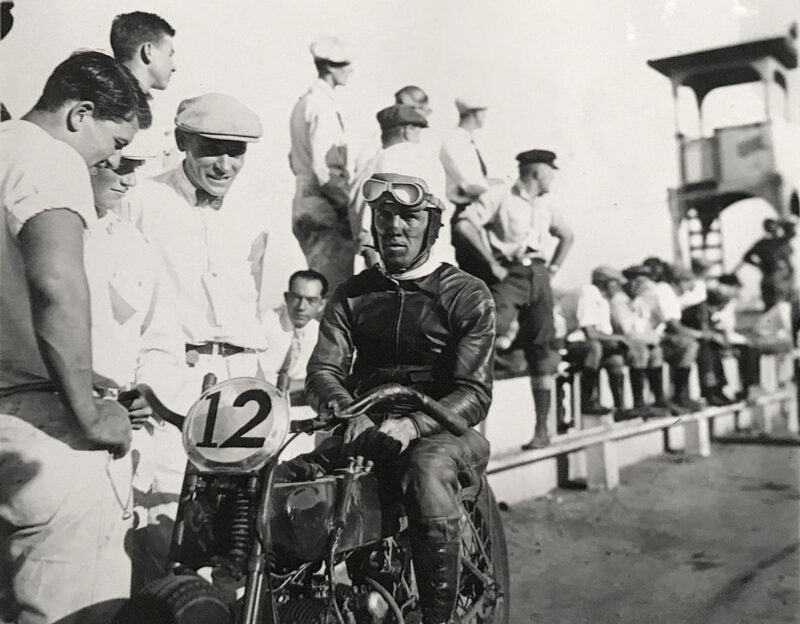 Announced in 1933 for the 1934 racing season, Class C racing was open to 45CI (750cc) sidevalve motorcycles, and 30.50CI (500cc) OHV bikes. 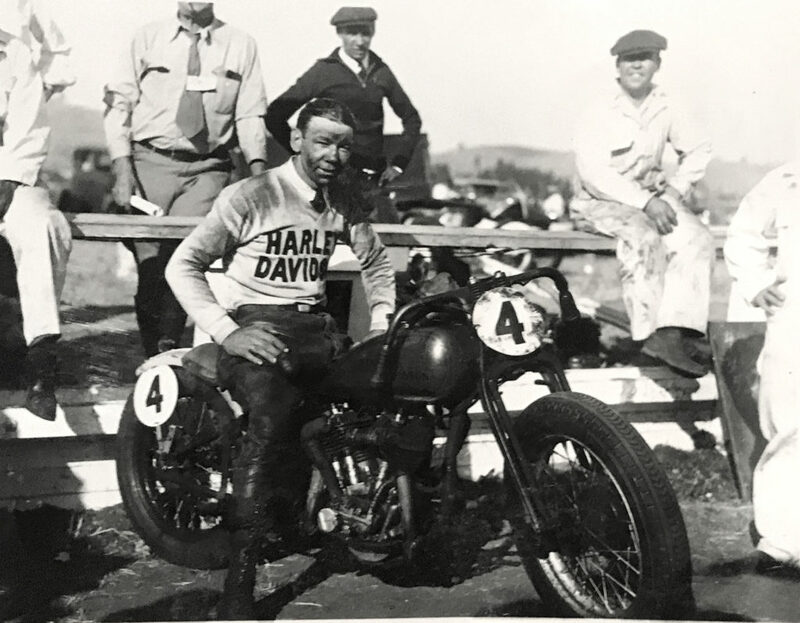 The races included flat track, hillclimb, TT/Steeplechase (flat track with jumps and turns, which was open to larger-capacity bikes in the Open Class as well) and even road races (rare). 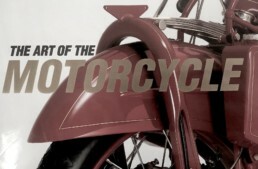 Eligible machines were production models available from factory catalogues, which meant AMA-sanctioned, national-level racing was suddenly an affordable proposition for anyone who could to buy (or sponsor) a motorcycle, and as the bikes were based on standard roadsters, they weren’t particularly expensive. 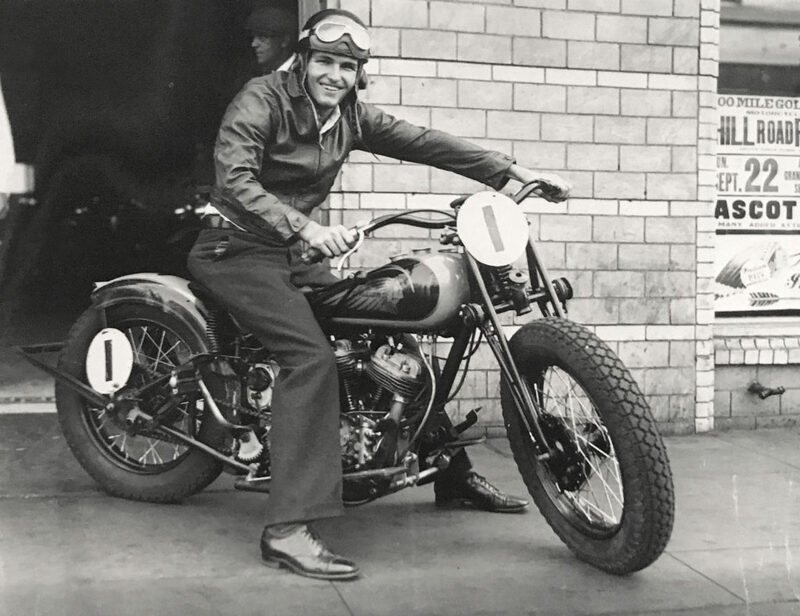 Harley-Davidson modified their Model R 45CI twin, and Indian their Scout, and both factories shortly made racing versions available; H-D with the RLDR racer (that became the WR in 1938), and Indian the Sport Scout and Daytona Scout racers. Both factories were locked in an intense rivalry, developing their lowly sidevalve engines to unanticipated peaks of power. 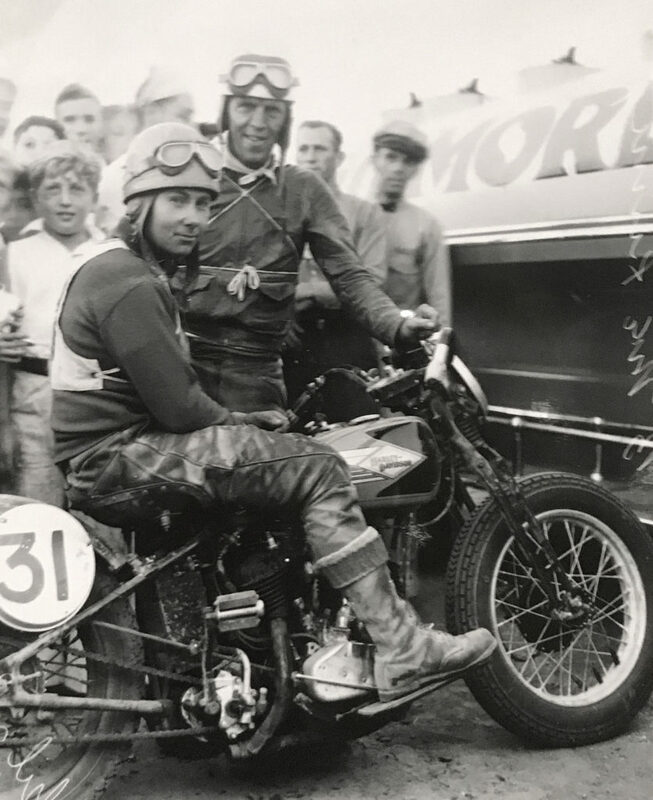 By the end of the 1930s, the best of these sidevalve racers were capable of hitting 110mph on the dirt, and after WW2, tuners like Tom Sifton made the Harley-Davidson KRTT flathead racer a device of amazing speed, clocking 150mph on the banked oval of Daytona in its inaugural 1962 season. These photographs, captured at the Bonhams Las Vegas sale, were part of an album of 1920s/30s California racing history. 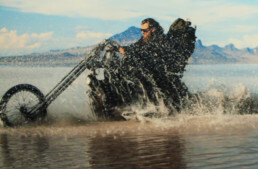 They show a few of the professional riders moving from the old Class A to the new Class C racing on the tracks of Southern California – mostly at Ascot, in this case. The worst of the Depression had passed, and Class C racing would soon prove extremely popular across the country as a wave of new competitors joined the fray, elbow jockeys flinging roostertails skyward to the thrill of the crowds, just like today. noticing all the great vintage racer photos……Were there always K-70’s?????? That’s what I thought! But the photos were labelled Cody…will amend, and thanks Rich!